Well I made it through the first trimester. 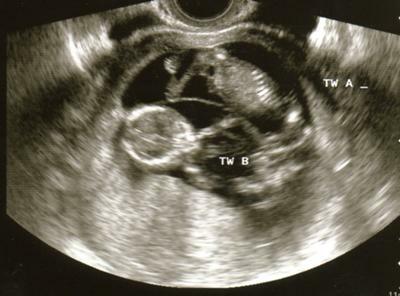 Here is a picture of the 12 1/2 week scan. One baby clearly takes after me by NOT being camera shy. The other is upside down, and only showing a side profile. All limbs, organs etc are accounted for and all are working well. Good growth. Everything is running smoothly and I could not be happier.